AIM Solder, a leading global manufacturer of solder assembly materials for the electronics industry, is pleased to announce that Dr. Mehran Maalekian, Research & Development Director, will present at the IPC APEX EXPO 2018 taking place February 27th – March 1st, 2018 at the San Diego Convention Center in San Diego, California. 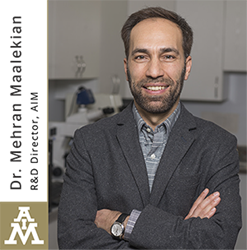 Dr. Maalekian will share his extensive knowledge of and review the industry needs for solder alloys that can execute effectively in harsh service conditions and examines potential solutions for failed or flawed applications. With the extensive adoption of Sn-Ag-Cu (SAC) alloy as the de facto lead-free solder standard, the limitations of this alloy and its family are more clearly revealed. Specifically, SAC305 has shown poor creep resistance in harsh service environments. If aged or exposed to high service temperatures SAC305 undergoes substantial microstructure evolution leading to degradation of mechanical strength of the solder joint. In this work, effects of thermal aging and silver content on mechanical performance, intermetallic growth rate and reliability of SAC alloys are reviewed. Then, a lead-free solder alloy is introduced that exhibits superior performance for demanding applications. The new alloy, with higher strength and stable creep properties shows superior thermal fatigue resistance compared with SAC305. It is demonstrated that the new lead-free high reliability alloy can be a good solution for harsh environment electronics applications.